The case of Solomon, a record breaker and maker is yet to be forgotten in history. 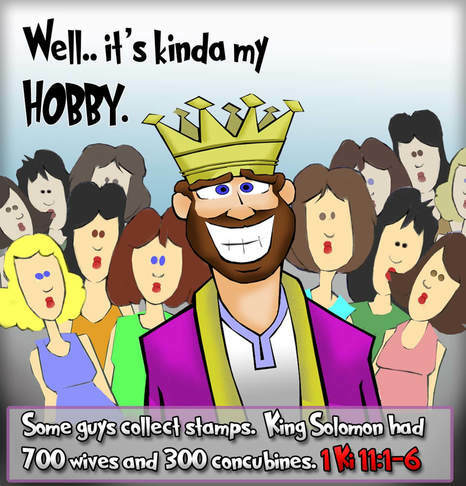 Solomon, son of David married over 1000 wives. (700 wives, 300 concubines), Wow! He must be a working machine. Yet, God blessed him with more riches, wisdom and happiness. Although there is no record of whether Solomon was able to satisfy his numerous bed mates sexually. Nevertheless, it is on record that God was with him (1King). He controlled the entire region west of the Euphrates and had peace on his borders. 1King states that he owned 12,000 horses with horsemen and 1,400 chariots. Solomon got so busy with his sexual duties that he even forgot God and his commands. A Virgin fetish! That explain King Solomon 1000 wives since he always needed a new one. Will I get my PYGOD‘s wives™ up to a thousand? It sound like a lot of handy work!